If you’ve been following me and my feline household, you’ll know that several of the cats who live with me now were rescued and fostered through the efforts of Pittsburgh C.A.T. Mariposa emerged from the abandoned house where I trapped and removed a dozen adults and 15 kittens and I am fostering her through Pittsburgh C.A.T. Basil and Bella were both rescued by volunteers, Hamlet and his sister Ophelia, too, were Pittsburgh C.A.T. cats. Charm and her adorable children were as well, and Alvina, Simon and Theodore. They each came to my household in different ways, with different stories and different needs, but all were rescued and given a new chance at a life in a loving home because of Pittsburgh C.A.T. Pittsburgh C.A.T. 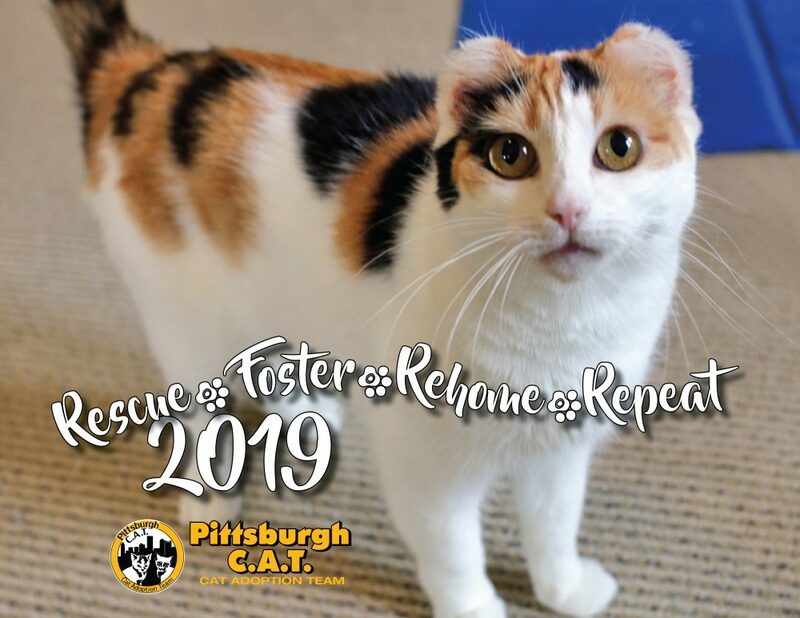 has fostered and found loving forever homes for almost 500 rescued kittens and cats every year from TNR projects, local shelters and right off streets, reducing the population of homeless cats in the Pittsburgh area by thousands each year and spreading education about spay and neuter, feline care and behavior and compassion. In this calendar you’ll read about a couple dozen of those rescued cats who’ve come in with dire medical need from abuse or accidents, chronic or acute illnesses, and near starvation. Healing all those cats and kittens, feeding them and spaying and neutering, keeping up with vaccines and microchips, does not come cheap, but it’s the best way to rescue cats. Pittsburgh C.A.T. is not a 501c3 and can’t apply for grants, so sales of this calendar will help pay for lots of medical care. Help Pittsburgh C.A.T. finish off 2018 and get ready for 2019! Calendars cost $25.00 each including shipping and handling. After costs Pittsburgh C.A.T. receives $10.00 from every calendar sold, and if you’re local and want to pick it up, they’ll get an extra $5.00! They will be ready about December 8. Each month features a cat or cats and the story who Pittsburgh C.A.T. volunteers rescued through TNR or rescue from abandonment, neglect or abuse, offered medical treatment, fostering, socialization, and a loving forever home that met their individual needs. You know how I love to write and share these rescue stories, and along with helping these organizations who I support with my particular skills, writing and sharing the rescue stories included in this calendar was probably the greatest creative joy. Meet McGhee, Parker, Violet, Thistle and Sparrow, the “weed wacker kittens”. That may sound foreboding, but it all ends well. Thanks to compassion and the commitment of volunteer rescuers they are alive and healthy and their mom will never have to worry about kittens again. A worker was clearing overgrowth on a property to be renovated and found a litter of newborn kittens; seeing he’d accidentally injured them he took them immediately to the management office. The manager knew of us and contacted us right away. Because a few of the kittens were injured they could not be left until their mom came back, but got medical attention and went to a bottle feeder. But mom was not to be left behind—she would miss her kittens, they needed her nurturing, and she could still reproduce. Rescuers set traps and watched for two days to find her. It was pretty clear she was the tortie who wandered around crying to break your heart even when rescuers showed her her kittens, until she went into the trap. She was reunited and was a great mom but had no interest at all in being a housecat so was spayed and released when kittens were eight weeks old. All the kittens survived, but Violet did lose her right ear, Parker was unintentionally ear-tipped, and Sparrow lost an eye. The worker whose quick decision to get care for them is thrilled they all survived, and the manager has joined Pittsburgh C.A.T. to transport fosters wherever they need to go. In addition, each month is sponsored with an ad from veterinarians, businesses and individuals who work with and support Pittsburgh C.A.T., including five of the veterinarians who regularly take a shift at clinics to spay and neuter plus pet sitting and pet first aid training so you have ready resources for services you and your pets can use right at your fingertips. Each month also features the standard holidays as well as pet-related holidays and events. The front of the calendar also includes information about Pittsburgh C.A.T. I designed and am publishing this calendar on behalf of Pittsburgh C.A.T. for which I volunteer and support. All proceeds of sales of this calendar after costs will go directly to Rescue-Foster-Rehome-Repeat wherever the need arises. Price includes shipping. You’ll find a box to enter your address or special instructions in your shopping cart. Calendar is 8.5″ x 11″, 28 pages saddle-stitched and includes information on Pittsburgh C.A.T. and clinics and adoption. Read more about Pittsburgh C.A.T. What a lovely calendar!! I wish you much success with it! Purrs from Deb and the Zee/Zoey gang. Thanks, Deb! It’s always not only fun but a real eye-opener to put this calendar together each year, so many rescues and stories but it not only shows others, it also shows us what we do.